Toffee Brownies - Golden, buttery toffee pieces are baked in to this dense and super rich brownie with the texture of a chocolate soufflé. 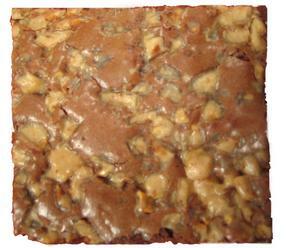 Loaded with dark chocolate chunks the size of bullets and toffee for a smooth and delightful crunch. This is the brownie for the toffee lover. Your truffles, cookies and brownies are the best.. I have never tasted anything like them... I'll give you a testimonial any time.